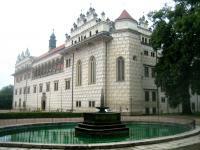 Litomysl Castle is a monumental Renaissance castle dating from the years 1568-1581. It is an outstanding and immaculately preserved example of the arcade castle, a type of building first developed in Italy and modified in the Czech lands to create an evolved form of special architectural quality. The noble family of Pernstejn's rebuilt the original Mediaeval castle into a Renaissance castle in the second half of the 16th century. Despite of later reconstructions of interiors especially at the end of the 18th century the appearance of the castle remained almost intact including the unique scoring decoration of facades and fronton. Litomysl Castle was one of the three castles of southeast Czechia that were still on my to do list. I decided to tackle all of them (Litomysl, Kromeriz and Lednice/Valtice) during one fast paced weekend break. Early Saturday morning I flew to Vienna, a more convenient hub than Prague for this scope. There I rented a car and drove for 3 hours until I arrived in Litomysl. Not all rental companies allow you to take the car from Austria into Czechia (Sixt does). And you have to be aware to buy a Czech toll vignette at a petrol station after crossing the border. Otherwise it’s all straightforward. Thanks to its ca. 8,000 sgraffito ‘bricks’ that fully cover its exterior, this Castle strongly stands out amidst its baroque surroundings. It is located above the town center on Castle Hill and surrounded by a French formal garden, the English style castle garden, the brewery, riding hall, stables and carriage house – which all belong to the core zone too. I did not plan to take castle tours at all 3 castles of this weekend, but for Litomysl I thought it could be worth it because its tour includes a visit to the 18th century theatre. Between April and October there are regular tours scheduled. At the ticket office I was put on the list for the 2 pm tour. So I had over an hour to spare, which I spent in the city center (‘dead’ on a Saturday afternoon, just as I experienced in Zatec earlier this year) and in the cheerful coffee shop that is located in the castle’s former carriage house. Afterwards we went on to the first floor, which has the best views of the courtyard with 3 rows of arcades that characterizes this building. From there we entered a series of palatial rooms. They have original wooden floors but no shoe covers are required – there’s a red carpet that you walk on. The whole building isn’t that large, so we only visited some 8 rooms furnished with rococo furniture, colourful painted wallpaper and the likes. The final room of the tour is the Horse Rider’s Anteroom: the Waldstein-Wartenberg family that owned this castle in the 18th century loved their horses and bred a special race of them at Kladruby (of the stud farm TWHS). Huge paintings of these different coloured horses adorn this room. This WHS belongs to a myriad of connections that are so common in European palaces – I added sun dial (there are 2 of them), rococo (reading room in the interior), library (in the 17th century it held 4,000 books), neo-classical (theatre), baroque (sundials and 18th century modifications of the interior), French formal garden, English landscape garden. I discovered a new connection too: Litomysl is part of the European Route of Historic Theatres. This covers lots of theatres and opera houses in different European regions, including Cesky Krumlov Castle Theatre, Graz Opera House, Margravial Opera House, New Palace Theater in Potsdam and the Teatro Garcia de Resende in Evora. I found the chateau at Litomysl somewhat underwhelming, and could not identify any features of outstanding universal value. The train from Chocen to Litomysl no longer operates. The best connection to the site I could find was by bus from Ceska Tribova station. The special feature of the Renaissance castle in Litomysl is the faҫade, the complete outside is decorated with thousands of rectangular sgraffiti. The images are different from each other - fruits, animals, people, leaves - and we had great fun identifying our favourites (the photo shows one of mine). The faҫade is largely uniform and only the south wing is interrupted by arcades at the top floor. The courtyard has three-storey arcades at three sides and on the northern wall are large sgraffiti depicting ancient and biblical scenes. At the time of our visit the area between the castle and the outbuildings was inaccessible due to construction works (also the nearby cathedral). But as we stood at the fence and tried to view the sgraffiti decorations, a construction engineer became aware of us. We told him that we came 500 km from Austria to visit the castle. Then he allowed us to go in and we could view the castle from all sides. 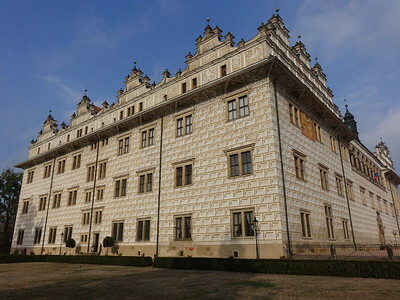 Sure, Litomysl is just one among many castles on the WH list, but I liked its unusual exterior: the sgraffiti, the Renaissance gables and the arcades in the courtyard. Well, this is another typically Central European palace, nice, but nothing extraordinary. It takes a while to get to this town by public transport, and once you have reached the palace, you can go on a guided tour - of course only in Czech - and see the usual procession of rooms. They are reasonably nice and interesting, and Litomysl is a pleasant enough town, but this is really something for World Heritage collectors. The theater is probably the most interesting part. 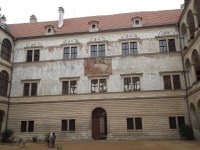 I have been many times to the huge castle of Litomyšl, a Renaissance masterpiece, projected by Giovanni Battista and Ulrico Aostalli, that belonged to the family Pernštejn. It is an asymmetrical building with four wings and three storeys: one of them is largest and another one has a two-storeyed arcaded groin-vaulted gallery, that continues in the second court on other two sides; there is also a polygonal tower and a smaller oblong court. The external facades, that have graffiti imitating diamond ashlars and a lunette on everyone, have also above the plinth of the ground floor and on the other floors stone biforate windows with reveals, lintels, hood mouldings and volute brackets; the main portal on the south façade has a semicircular arch, two double rusticated columns and a flat lintel with the coats of arms of the Pernštejn and Manriques de Lara families. Above the cornice is an attic gable with pilasters and windows and the finials have squat bases, pillars and a small attachment. On a façade there is the end of the chapel, with twin triforate lancet windows and a polygonal turret with a pyramidal roof. The second courtyard has on three sides semicircular arcades; on the ground floor are rusticated pillars,arches and spandrels and the other floors have columns with feet, block socles, plinths and Tuscan capitals on the first floor, Ionic on the second; between the plinths are parapet walls with central pilaster strips. One façade has between the window sill of the first floor and the cornice a monumental graffiti with scenes from the Old Testament, classical history, Roman and Renaissance virtues, huntings and busts of warriors and heroes in the cartouches of the lunettes. The neo-Classical wood theatre for 150 spectators sitting in the nine loggias and on its lower floor has nice painted decorations in the auditorium and in the stage and the machines. The Renaissance rooms have Baroque and neo-Classical plasterworks, wall and ceiling paintings and the original furniture. The Renaissance chapel has a nice portal, barrel vaults and paintings. In the first court and in the park are preserved all the ancillary buildings, like the Baroque and neo-classical brewery, the two stables, with a nine sections facade, a portal, windows, lateral entrances and four dormers, the riding school, the Lord’s House, the coach house, an another small house, a building for the coaches, a fountain, the garden with a pavilion and the park. I liked very much the castle because of the quality of its architecture and its decorations. It's worth to be visited if you are in Moravia (if you go there you can visit it only with guided tours) and justifies the incription. This was one of my favourite trips in the Czech Republic. The interior of the palace is nothing remarkable; however the exterior and the town itself were very rewarding. 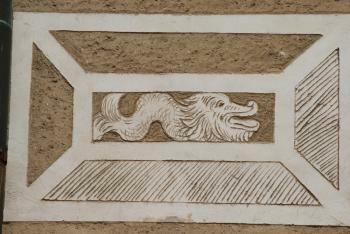 The main feature of the castle is the sgraffiti decoration on the outside, what from a distance look like bricks are in fact designs made from etching away plaster to reveal the undercoat. Each design is different; the centres contain many different images, from leaves to people. It gives a very nice impression, it also features on the main wall of the interior colonnaded courtyard but it is used here to depict biblical/ mythical scenes on a much larger scale. The only way to see the interior of the castle is on a tour of which there are two different types. If you do want to see the interior I would recommend trying to get the tour which includes the theatre as I hear this is the highlight. Unfortunately I ended up on the second tour which led me on a procession through yet another average European Castle. I wish I hadn’t wasted my time on it. The Castle is situated just above the centre of the town and was the birthplace of the composer Bedrich Smetana. He plays a large role in Czech cultural heritage and many concerts are given in his honour through out the year. The interior of the castle did hold one more delight though, in the shape of the former wine vaults. These now house a display of the works of local sculptor Olbram Zoubek; who after upsetting the communist government spent 20 years restoring the sgraffiti decorations on the castle. It is quite cold and eerie but you get a look at some interesting sculptures in an otherwise closed part of the. To fight off the cold you are given a blanket and mulled wine. It can be a bit of a trek to get here, there is a small local train that meets some of the trains to/from Prague at Chocen. It took me about 2h 45m from Prague, or there are direct busses from Olomouc 1h 40m. check www.idos.cz for more details. I had a really great day here and I would recommend it for people that want to see the real Czech Republic away from the bustling crowds of Prague. You wouldn’t be missing much if you skipped the palace interior though. The name Litomyšl goes back to the year 981 when a hill fort was first mentioned in a Bohemian Chronicle. Today’s Litomyšl is a friendly little Czech town just waiting to be explored by tourists and with a brilliant Renaissance arcade-castle. Vratislav of Pernštejn was the nobleman who took over the castle in 1567 and started its transformation into a large-scale palace with courtyards and porticoes covered with “s-graffiti”, a technique of wall decoration, where layers of plaster in contrasting colours is applied on to a moistened surface, and then scratched to produce a drawing. The interior of the Litomyšl Castle offers well-kept rooms and richly decorated salons and can also boast one of Europe’s three surviving 18th century castle theatres. Below the castle hill lies the small town with the same name, a beautiful little town with one of the largest squares in the Czech Republic flanked by Renaissance and Baroque houses and arcades to keep you out of the rain or burning sun. Loggia: AV evaluation Of the features in the interior of the castle one of the most striking is the fine Neo-Classical theatre from 1796-97 in the western wing. Constructed entirely of wood, it can seat 150 spectators in nine loggias and its lower floor"
Breweries: AB evaluation :- "Among the ancillary buildings, the most interesting is the Brewery, which lies to the south of the first courtyard. Originally constructed as a counterpart to the castle, with sgraffito decoration, it was substantially reconstructed after the 1728 fire and received what is its present appearance, which blends elements of High Baroque and Neo-Classicism, after the 1775 fire". "Bed?ich Smetana, one of the best Czech composers of all time, was born in the Litomy?l castle brewery in 1824" (His father had "managed several breweries before coming to Litomy?l in 1823 as brewer to Count Waldstein, whose Renaissance castle dominates the town" - Wiki).